1Offer subject to credit approval. 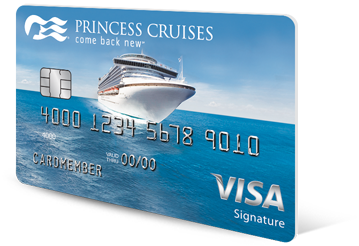 Not everyone will qualify for the Princess Cruise Rewards Visa and its benefits. If at the time of your application you do not meet the credit criteria previously established for this offer, or the income you report is insufficient based on your obligations, we may not be able to open an account for you or you may receive a Platinum card. Benefits will vary depending upon the card for which you are approved. Please review the materials provided with the Cardmember Agreement you will receive after account opening for more information about the benefits that will apply. This offer is available to new cardmembers only. For information about rates, fees, other costs, the reward program rules, and benefits associated with the use of the credit card program, please see the Terms and Conditions. 2Please review the Rewards Summary for important information about the program benefits and features listed above and the Terms and Conditions for full details about the rewards benefits (such as how points or miles are earned), interest rates and account fees and terms for this particular offer before applying. Bonus Points: Bonus points (10,000) will be awarded at the close of the first billing statement in which you make your first purchase or balance transfer and will then be credited to your Princess Cruises Rewards Visa Signature Card or your Princess Cruises Rewards Platinum Visa Card Account. Balance Transfer Bonus Points: Earn one point per $1 in balance transfers that post to your Princess Cruises Rewards Visa in the first 30 days after your new account is opened, up to a maximum of 5,000 points. There is a fee for Balance Transfers. Balance Transfer Checks and Convenience Checks do not qualify for balance transfer points. See the Terms and Conditions for complete details about this offer. Earning Points: Cardmembers will receive one (1) Princess Point for every one U.S. dollar ($1.00) of Net purchases made on the Account rounded to the nearest dollar and two (2) Princess Points for every one U.S. dollar ($1.00) of Net Purchases from Princess Cruise Lines including online and onboard purchases. Cash Advances are not eligible for Points.